Shaw carries a full line of stainless steel sanitary clamp fittings. Clamp Style Fittings are very popular because of the ease of assembly and breakdown of process lines and equipment. Shaw Stainless offers Clamp Fittings in 304 and 316 stainless steel. Gaskets for clamp fittings are available in several different materials, Buna-N, EPDM, Teflon®, Viton® and silicone. Lightweight and heavy-duty clamps complete the unions. Sanitary clamp fittings meet all 3A requirements. We house a huge inventory of sanitary clamp fittings in 304 and 316L stainless steel. From adapters and elbows to clamps and ferrules, we have a complete inventory of stainless steel sanitary clamp 90 degree elbows to meet your specified needs. View our full line of stainless steel products. We have a large stainless steel sanitary clamp 90 degree elbows inventory to meet our customers specifications. For more information, view our dimensional data. 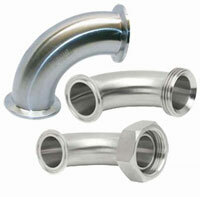 We offer stainless steel sanitary clamp 90 degree elbows in a variety of sizes and specifications. Check out our stainless steel resource grade chart. It lists multiple functionality and applications of different grades of stainless steel. Our Reference Catalog is designed to identify our SS products including our stainless steel sanitary clamp 90 degree elbows. Specification charts and general dimensional illustrations aid in identifying products. Clamp Style Fittings are very popular because of the ease of assembly and breakdown of process lines and equipment. Shaw Stainless offers Clamp Fittings in 304 and 316 stainless steel. Gaskets for Clamp Fittings are available in several different materials, Buna-N, EPDM, Teflon®, Viton® and silicone. Lightweight and heavy-duty clamps complete the unions. Clamp Fittings meet all 3A requirements.